We love hearing about how our members are doing with our Holdem Bot software, and we're always getting feedback. Lately, there have been some interesting reports in our support forum regarding the different profiles that are available for use in the bot. "I'm using the new custom time delay feature to delay some of the actions in Doodle 104 (usually with strong hands) and I've been booking winning sessions every night this week." "With the DoodleMTT I have played around thirty 27-man and larger field Guaranteed tournaments. I've made the final table or outright won 12 of them. This profile is good!" "I ran eight 45-man MTT's yesterday with the most current version of DoodleMTT and I was shocked. 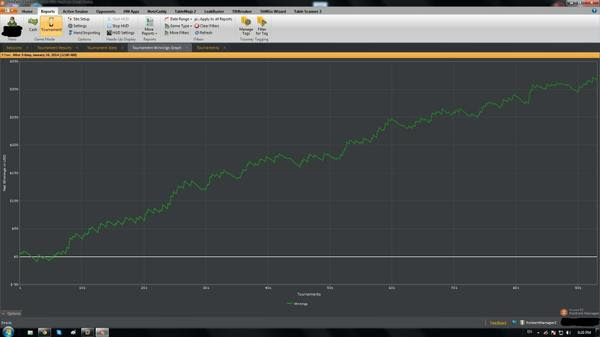 The profile made 6 final tables and bubbled once as well! DoodleMTT took two 2nds, one 3rd, two 4ths, and one 5th place!" They're up over $300 so far, and you just have to love the slope and direction of that chart line. We currently support about a dozen iPoker rooms (including EU, France, and Italy rooms), 888 Poker (including the Spanish room), four Winning Poker Network rooms (USA citizens allowed in all 50 states), Bodog, Bovada, Cake, and Intertops Poker.